Now, I normally talk about people food on here. However, we recently tried out an excellent dog food (let me rephrase that, our dog Daisy tried out an excellent dog food!) that I want to tell you about. Our vet currently is all about dog food that doesn&apos;t have a bunch of additives and stuff that our dog doesn&apos;t need. He actually has a list of foods on his preferred list that he gives you when you come in for your first visit. For me (who never had a dog before), it was extremely helpful. 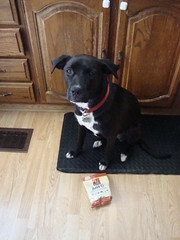 I am thinking that Rachael Ray Nutrish just 6 dry dog food will also make his list. Nutrish is a limited ingredient dog food with only six simple, natural ingredients, plus vitamins and minerals for complete and balanced nutrition. It does not include corn, wheat, or soy. Even better though, did you know that proceeds from Rachael Ray’s Nutrish product go toward helping animals in need through her Rachael’s Rescue organization? Daisy seemed to like the food. I actually caught her trying to open it before we gave it to her. (<– see picture). 🙂 The best part of Nutrish is that you too can get a free sample, so you can try it for free and make sure your dog enjoys it too.